Carefully consider the size that you need when selecting your bimini top. The mounting point you choose will impact the size of frame you need, the position of the top, and the shade it will provide. WIDTH: Determine where you want the mounting points to be because this will set the width of the frame. Keep in mind that this will also determine which part of the boat gets shade. It will also set the position of the top when it is folded up and not in use. LENGTH: After you have chosen the mounting point and determined the width, then the length of the top will determine which part of the boat receives shade and how much coverage is available. 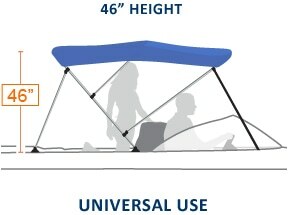 HEIGHT: Consider the primary use of the bimini to select the proper height of the frame. Do you want to be able to stand under it? Fish under it? 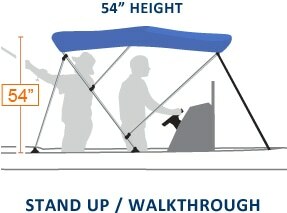 Measure upward from the selected mounting point while standing on the deck to get a feel for how much room you will have once the bimini is installed. 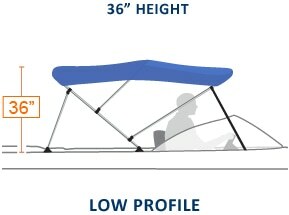 Boat Bimini frames are available in widths from 54" to 103" and come in a round tube 3 bow style. We offer three different frame heights to allow you to choose the best top to accommodate your required use: 36" height, 46" height or 54" height. Canvas tops are available in three different fabrics, including Sunbrella(R). Each fabric grade is offered in a wide variety of colors with an available stripe option. Widths vary from 54" to 103"
Heights vary from 36" to 54"